Poking around Old Town Alexandria’s waterfront is always interesting, and I just don’t get down there enough. Maybe because it’s so close and easy to do, scheduling a walk there seems like a bit of a cop-out as opposed to snooping out something more unusual and out-of-the-way. But there were some events over the past couple of months that made it too hard to miss. In June a replica of the Hermione visited Alexandria on her tour of the eastern seaboard of the United States. The original Hermione was a French frigate that ferried ferried Lafayette to the United States in 1780 in support of the American Revolution. In contrast to the fanfare that accompanied her subsequent visit to New York, she crept into Alexandria during the dead of night and left the same way several days later. We went for an evening walk around Old Town during her visit, but the waterfront area was very crowded, and all the advance tickets for on-board tours were sold out long before the Hermione arrived. Fortunately I visited that morning and took a few photos shortly after dawn. There were wildfires raging Canada at the time, and smoke from them was carried 1,600 miles in the upper atmosphere through the jetstream to impart a yellow haze to the skies at dawn. The side-by-side appearance of Hermione and Josephine in the last of these photos isn’t quite as interesting of a coincidence as it might first appear, because the original Hermione ran aground and wrecked in 1793. That was two years before Napoleon met Josephine in 1795; the same year he gave the Royalists in Paris the “whiff of grapeshot” that was to launch his career. Last Friday was occasioned by a blue moon, so naturally we had to take a walk down to and around the waterfront to check it out. 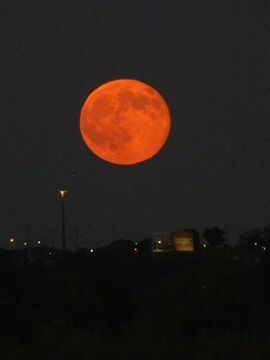 A blue moon can either be the second of two full moons in a single calendar month (what we saw), or the third of four full moons in a single season. In any case, the moon wasn’t blue, but red at moonrise, as seen in the wonderful photo at left taken by ML McMahon, and it gradually changed through yellow to its more typical silvery self. Before the walk an alert member of our group posted the time and direction the space station would be passing overhead that evening, and sure enough it zoomed by, visible for only six minutes. Guess we’ll have to get down to the Alexandria waterfront a little more often, especially considering all the plans they have for renovation down there over the next few years. This entry was posted in Hiking, History, Photography and tagged blue moon, Hermione, old town alexandria. Bookmark the permalink. Thanks, I hadn’t noticed that. Pity the moon wasn’t actually blue.